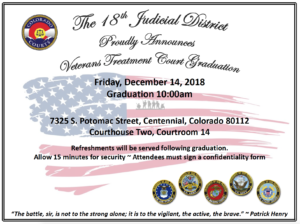 The 18th Judicial District proudly announces Veterans Treatment Court graduation. Our graduates have participated in intensive supervision and extensive treatment for over eighteen months. Their progress and commitment to recovery is an inspiration to all who have had the fortune of meeting them during their transformation. 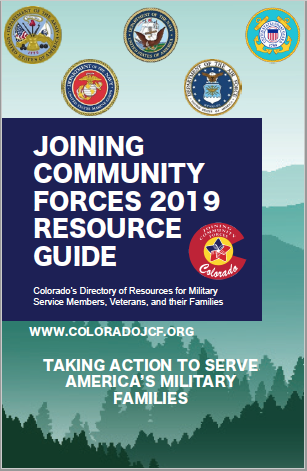 Veterans Treatment Court team members have demonstrated a high level of commitment to research, training, and using evidence based practices. 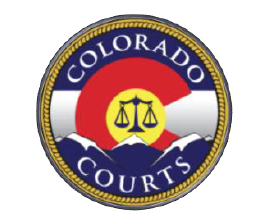 The Veterans Treatment Court continues to be a cross-systems collaboration between the 18th Judicial District, Addiction Research and Treatment Services, Veterans Administration, National Institute for Change, the Probation Department, the District Attorney’s Office, the Public Defender’s Office, the Douglas County Sheriff’s Office and the Arapahoe County Sheriff’s Office. These hardworking and dedicated professionals help clients make positive and lasting changes in their lives, and without their commitment, these graduations would not be possible. We would be honored to have you attend the graduation to see the benefits of your investment in our clients and our programs. If you have any questions regarding any of our Problem Solving Courts or the upcoming graduation, please feel free to contact one of our coordinators.